At a meeting today of the American Chemical Society (ACS), a team of researchers at Sweden’s Wallenberg Wood Science Center noted that they have devised a means of 3D bioprinting cartilage by using an “ink” composed of human cells. The new method could very well lead to “bespoke” (custom-made) prosthetics and replacement tissues for noses, ears, and damaged knees. It also has a host of potential applications in plastic surgery, sports medicine, and treatments for arthritis. To create the bioink, Gatenholm’s team essentially had to start from scratch and learn how to manufacture an ink of human cells that wouldn’t simply collapse into a gelatinous mess once printed. The team resolved this issue by incorporating a kind of “scaffolding” into the bioink: they mixed a paste of polysaccharides, derived from brown algae, with a cocktail of minute cellulose fibrils and human chondrocytes (cartilage-producing cells). The result was a malleable ink of cells that could be printed in any desired shape and, most importantly, retain that shape with its internal “skeleton” of fibrils. The chondrocytes in the ink were also capable of generating cartilage—at least in a petri dish. The next step was to test out the bioink’s performance in actual, living tissue. So the team grafted the printed tissues on mice, and they found that the grafts held and managed to produce cartilage. In order to boost the production of new cells, the researchers stirred in some human mesenchymal stem cells (derived from bone marrow); it’s a proven method, since stem cells seem to accelerate the propagation of primary cells. The results have been encouraging, and Gatenholm and his team are looking forward to spinning their research into real world applications. 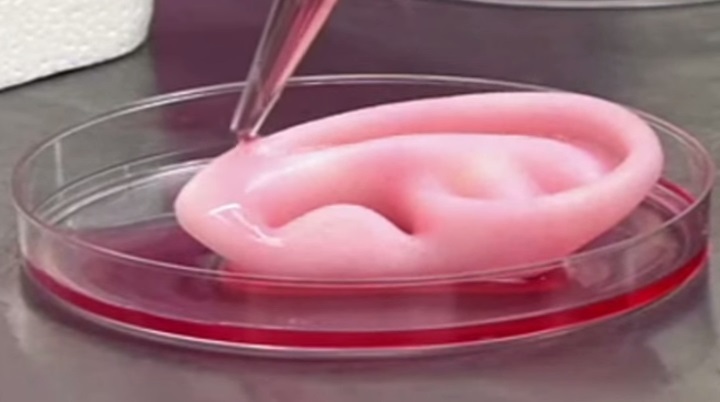 They’re working with a plastic surgeon to refine the process, and are even developing a 3D-bioprinted artificial human skin for cosmetics testing.